The arrival of a baby invariably necessitates major changes in not only lifestyle, but the organization and arrangement of your living space as well. Certain things need to be “baby proofed” and made “baby friendly” before the new, helpless family member arrives, especially in the following 3 places. The entryway. 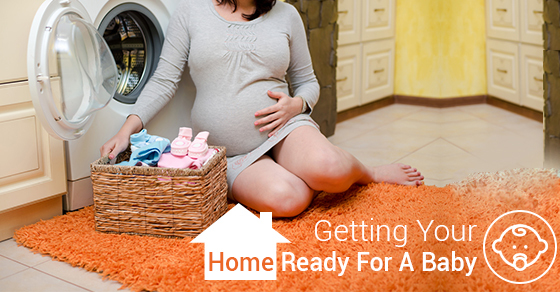 Once the baby arrives, you are going to be in and out of the house constantly. Walks, day care, a baby requires 24/7 around the clock supervision and care and you still have a life to live, so anywhere you go, he or she goes. Doing things like organizing the closet by outerwear or travel gear will help you get in and out and on with your day as fast as possible. Having a section just for the baby will decrease the chances of everyone’s stuff getting mixed up, and buying things like stroller hooks, and clearing out easily accessible space for diaper bags and travel high chairs will mean less time spent lifting and pulling and becoming more exhausted than you need to be. The Kitchen. A baby’s eating requirements mean many new additions to your kitchen. Spill-proof cups and bowls, breast pumps, miniature utensils, all of these are going to become part of a new culinary arsenal. Set aside a special cabinet just for the baby and once he or she becomes old enough to help themselves, let them. Store baby food and formulas in the cupboard, or your counter space will become a cluttered nightmare and buy a rack especially for baby bottles so they are easily accessible and not getting in the way of the rest of your family’s dishware. The Nursery. A baby’s accessories are numerous, but fortunately, for the most part, small, meaning you can store a lot with much less space. You can hang and fold baby clothes and double stack shoes a lot easier than you can an adults. Another major consideration is the rapid rate at which babies grow. This means constant new shoes and clothes. Establishing a hamper especially designated for those things which don’t fit anymore, and which you can then potentially give away is a good idea. Once a baby becomes old enough to start playing and interacting with the world, that is all they are going to be doing. Learning takes places through play, and it is easy to let your nursery become overrun by toys, some of which can be quite painful to step on. Having vertical space to neatly arrange toys is useful. Getting your house ready for the new little guy or girl can seem like a unprecedented living space change, and it is, but it doesn’t have to consume your life if you put some time and effort into planning it accordingly. Balancing what is best for your baby and most convenient to your drastically altered lifestyle while still maintaining some semblance of organization and your old life is possible if you know what you’re doing.